* BEST cover ever! Awesome, right? Oh, also, if you're already done with this election, be sure to skip ahead to 2012 in my column this week. * The WHHSH Watch Is Baaaack! That is, tomorrow I plan to shame the national reporters so lazy that the best they could do was start or transition parts of their stories with, "Nevada voters made sure that what happens in Vegas didn't stay in Vegas...". Our very first violator of the day is, in fact, not a journalist but some scribe with the Sharron Angle campaign who pushed out a missive this morning predicting victory that began: "For one night – tonight – what happens in Vegas, will not stay in Vegas." GROAN. Notice someone missing? The Angle campaign may believe that its anti-media position will help them, but it also ensures her utter irrelevancy as part of the national dialogue and conversation should she win. 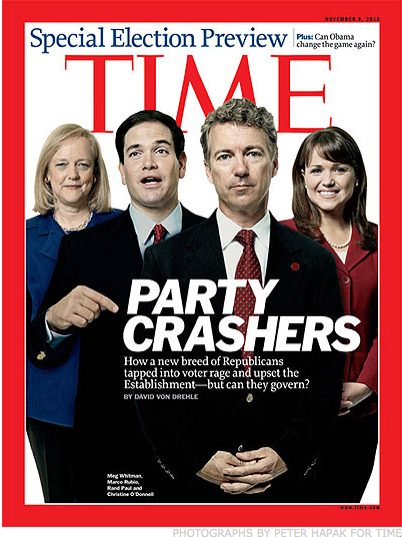 Why isn't the ultimate Tea Partier who may slay the ultimate Obama proxy on the cover of Time? Or even mentioned at ALL in this piece? 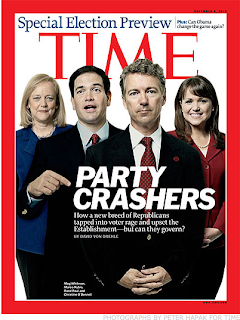 Why are two likely losers -- Meg Whitman and Christine O'Donnell -- there instead? I suspect it's because Angle wouldn't talk to Time or even sit for a portrait. Meanwhile, by another measure, Sharron Angle is the sixth most covered politician of 2010, behind THREE likely losers, Whitman, O'Donnell and Joe Sestak of Pennsylvania. That may -- and in O'Donnell's case definitely -- relate to candidates' proximity to the nation's media nerve centers of New York, DC and Los Angeles. But add this disinterest to the fact that many Angle voters I spoke with today at the polls seem to believe her more extreme positions don't matter BECAUSE she won't have any power, and I suspect Angle will be surprised at how irrelevant she is if/when she gets to Washington. * RalstonSpin. It's worth noting that Jon Ralston took yet another jab at the R-J for its Election Day editorial reiterating their desire to see Reid go bye-bye -- an opinion piece on the opinion pages, the nerve! -- but conveniently didn't care that the by-far dominant image on the newspaper's front page today was a beautiful shot of uber-popular Michelle Obama embracing the senator. How is THAT explained in the world view of those who view an entire reporting and editing operation as the subsidiary of Sharron Angle's campaign? And while the Las Vegas Sun surprisingly managed not to shove our faces in its pro-Reid bent today, the last big campaign story the paper chose to print was yesterday's front page piece about a 4-day-old John McCain appearance in which it is posited that the Arizona senator is champing at the bit to restart Yucca Mountain as a nuclear repository once Reid is gone. This sentence, in the reporter's voice, was particularly intriguing: "Reid is the only obstacle between McCain and his energy platform, which relies on construction of a nuclear waste repository at Yucca Mountain." As I've said before, both papers have their problems, but the Sun's bias in its news columns is far more overt and strident. It doesn't matter to Ralston because where his bread is buttered matters more than being fair to his colleagues.